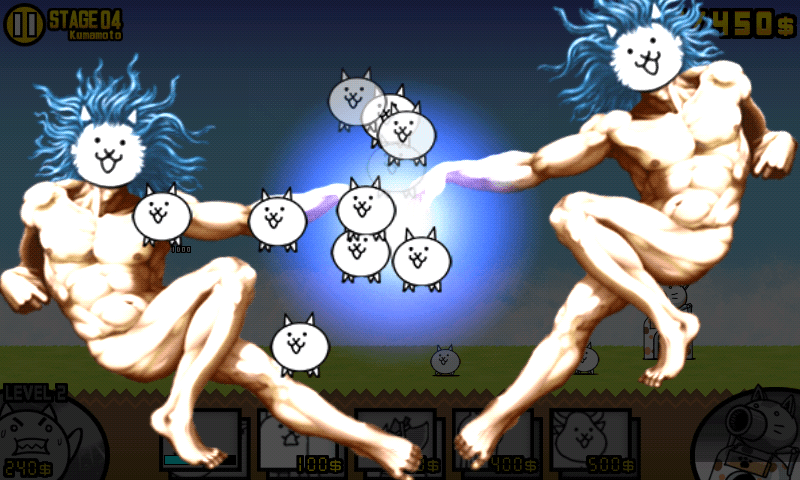 So far as I can tell, The Battle Cats is a game about helping cats destroy the world. 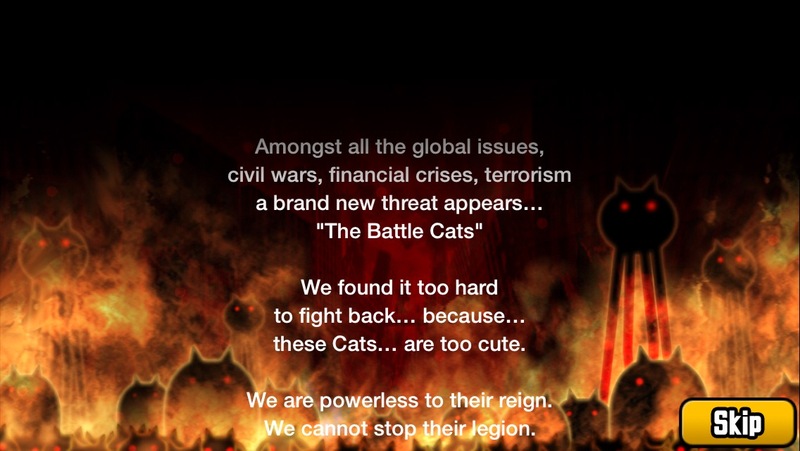 I'm not sure who you're supposed to be exactly: a cat god, a cat commander or a human traitor, but regardless your job is to assemble a diverse kitty army and send it marching ascross the screen to destroy the biggest cities in the world. Right off the bat, The Battle Cats signals its intention to be deeply, deeply weird with an introductory sequence where the text scrolls across an apocalyptic image of red-eyed felines, towering like alien tripods over the fiery remains of human civilization. While that raises some interesting questions about why the mastermind behind the Great Cat War is being interviewed on television rather than arrested—or whether the media has already been co-opted by our new cat overlords—what happens next is even more inexplicable. 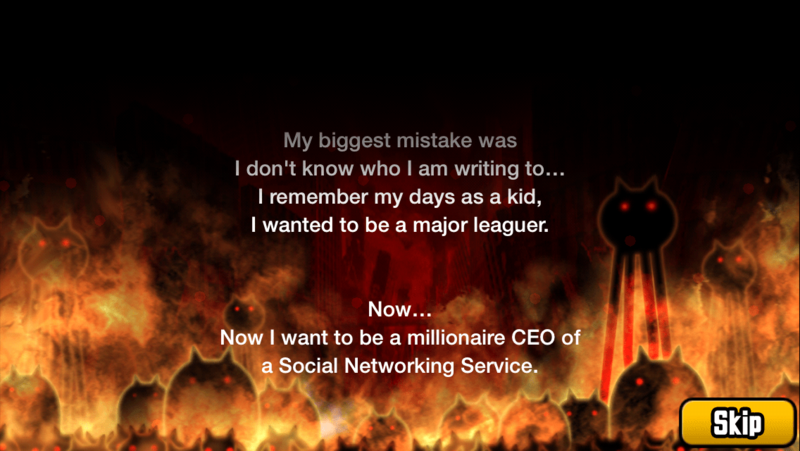 The narrator, whoever they are, decides that now is the time to reminisce about their dreams of being a professional baseball player and/or Mark Zuckerberg. 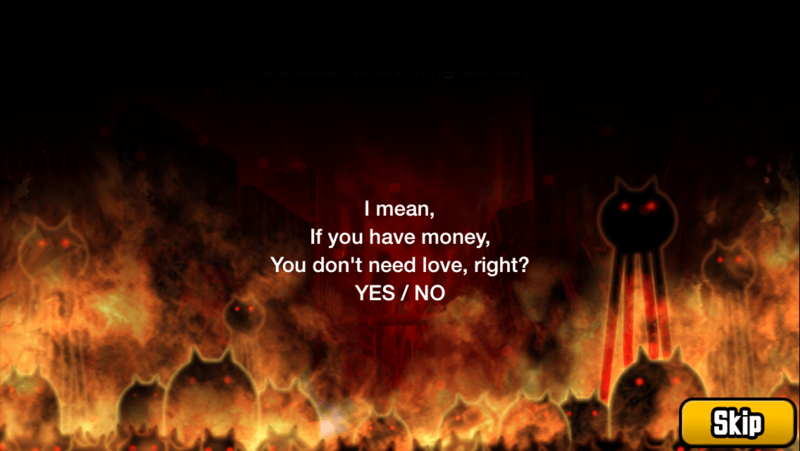 For no clear reason, the narrator then offers a half-hearted defense of consumerism, ending with a question that cynically asks the player for their opinion, yet denies them the ability to offer it. 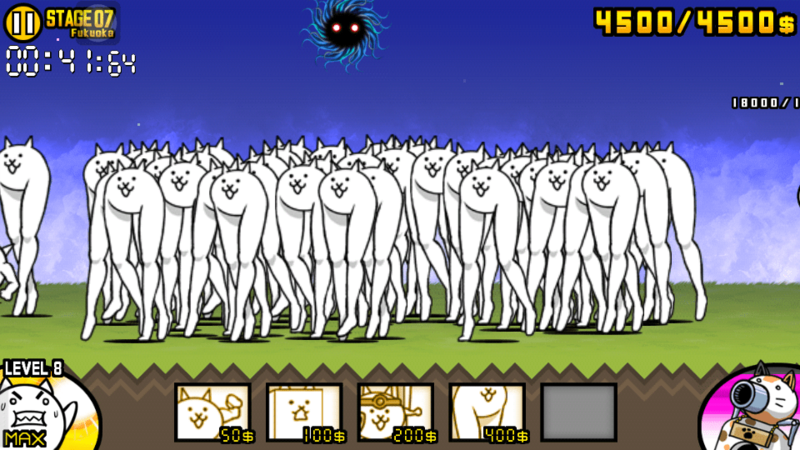 And then you start playing The Battle Cats. 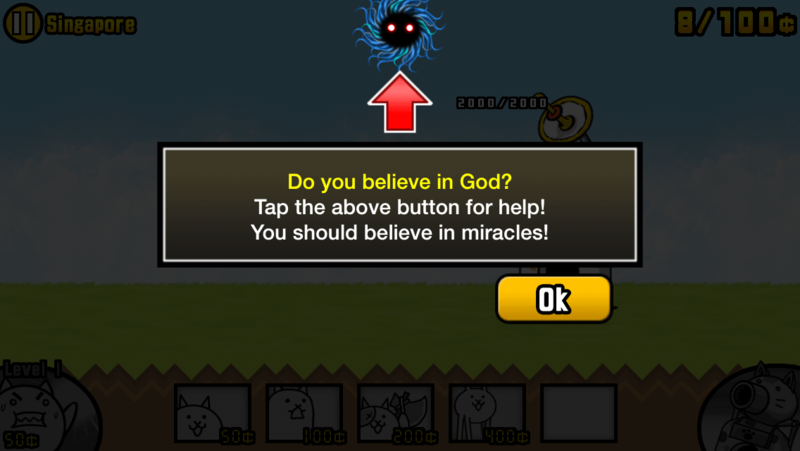 The actual experience of the game is pretty upbeat, as you march your cheerful cat minions across the screen and raze cities to the ground. Your war chest is constantly accumulating money, and you send out your cat conquerers as often as you can afford them. Fighting the opposing armies is a matter of strategy and timing—figuring out when to spend your cash on troops, and when to save it up for strategic purposes, like expanding the upper limit of your wallet. As time goes on, more and more cat units enter your arsenal, including cow cats, sumo cats, and even titan cats, which bear a striking resemblance to the hulking villains of Attack on Titan. The further you advance, the weirder things get. The game is free-to-play, and while real money can be used to unlock special cats or buy items that boost your abilities, the game feels totally satisfying without dropping a dime. If you get stuck on a particular level, it's a good idea to go back and grind for a little while in cities you've already defeated, and use those experience points to upgrade until the next city falls at your feet. 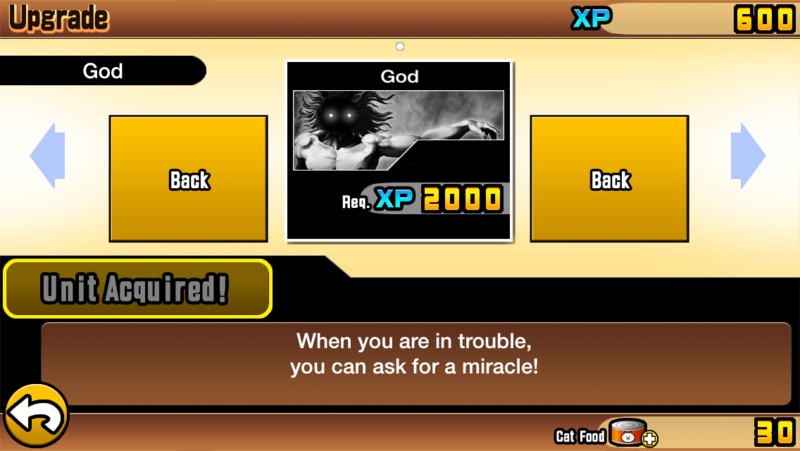 If you are open to spending money, it's worth noting that God is listed as a "Special Cat." No wonder they're winning the war. Blessed are the cats, made in God's image, for they shall inherit the Earth. 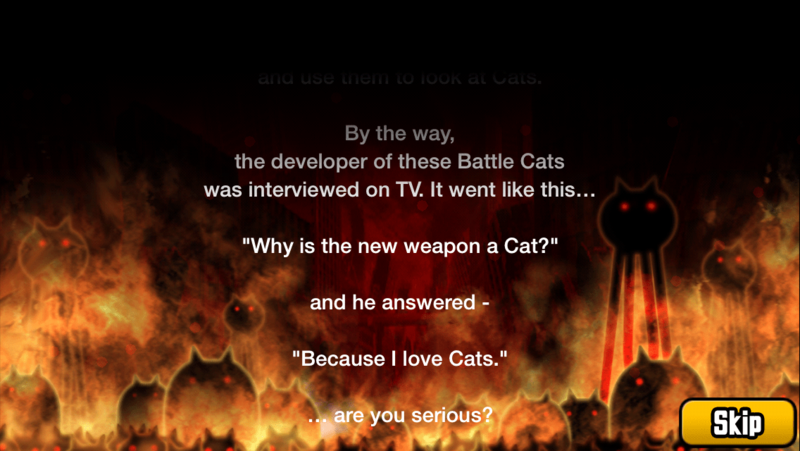 The Battle Cats is available for free on iOS and Android.